The Dolphin Cottage: Deck and view over Gulaga. The Dolphin Cottage: Front entrance. The Dolphin Cottage: Front entrance and parking space. The Dolphin Cottage: Living space and fold-out bed. The Dolphin Cottage: Living space, television and fold-out bed. The Dolphin Cottage: Master bedroom, queen size bed. 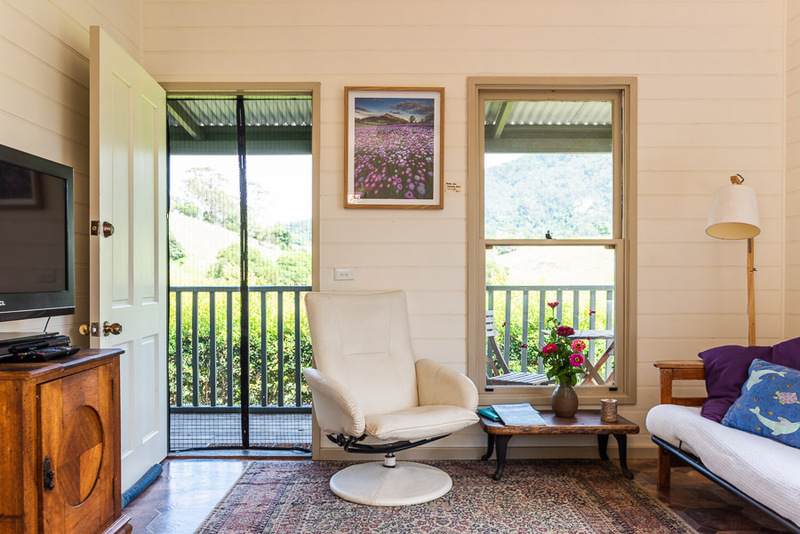 A one bedroom, fully self-contained cottage tucked down the hill, with a private deck and spectacular, picturesque views across the paddocks and the bubbling Tilba creek to Gulaga. The Dolphin Cottage is very special and a perfect digital detox getaway. Its enviable location means that there is no TV or wi-fi and limited reception but there are amazing views, great books, movies and unlimited peace and quiet. It includes a full kitchen (stove, oven, microwave, fridge) and laundry facilities, bathroom and separate toilet and a bonus fold out futon in the lounge area. The Dolphin Cottage also has its own contained yard, of course welcome for pets.